Galerie Jean Fournier is delighted to be inviting publisher and printer Michael Woolworth to present some forty works, old and new, offering an insight into the collaboration between the Woolworth Workshop and some of the gallery’s artists. This exhibition is the third segment in the cycle begun in October 2013: thematic exhibitions bringing together different generations of the gallery’s artists and showing new, more intimate aspects of their work. Founded in 1985 and situated in a historic arcade off Place de la Bastille in Paris, the workshop specialises in traditional techniques including stone lithography, wood engraving and monotypes, as well as photogravure, linocuts and copper etching. Although Michael Woolworth prints exclusively with 19th-century hand presses, his work remains uncompromisingly modern, with an ongoing emphasis on innovation and experimentation. He sees his workshop as a laboratory where the art of printing is constantly reinvented. Always working in close collaboration with his artists, he specialises in creative combinations of media and unusual printing supports. The exhibition comprises one-off works and small editions of 7 to 30, all numbered and signed. It also includes rare prints that have never been on public display before. The oldest works on show are by Pierre Mabille, who began working with Michael Woolworth in 1983. The gallery is presenting a series of 8 delicate prints, drawn freehand on lithographic stones then printed in black on papier japon. Jean François Maurige first began at Woolworth in 1991 and continues to work there regularly. His output includes astonishing experiments with wood engravings printed on both sides of cut-up rubble bags. These works are being shown together with an extensive recent series of lithographs whose white ground creates a luminous effect. A recent black and white lithograph is also on show. Frédérique Lucien used woodcuts and linocuts to generate vegetal forms – roses and leaves – in these works dating from 1995: a very big pink and white triptych and two diptychs on near-diaphanous papier japon. Stéphane Bordarier, who has been working at Woolworth for several years, is showing Dix Paires (2009) and Les Débordés (2013), together with a large, green-printed woodcut. The Liberties (2013), a book jointly published by the Woolworth Workshop and Le Théâtre Typographique, combines his woodcuts with poems by Susan Howe. Gilgian Gelzer is presenting a series of lithographs made in 2012, in which his dense lines and delicate traceries intermingle. A very large work is also part of the show. Didier Demozay began working at Woolworth this year. 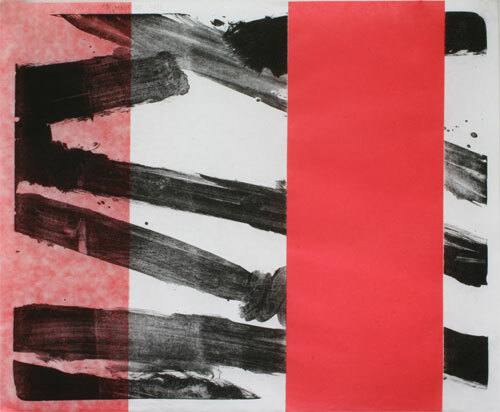 In a number of lithographs and a series of monotypes he reveals once again his deep-seated relationship with colour. The works are accompanied by informative, detailed plaques written by Michael Woolworth, who also asked each artist to contribute an anecdote on their collaboration. This exhibition is eloquent testimony to the unfailing energy and commitment of a rare, atypical workshop.